This is a crusher. 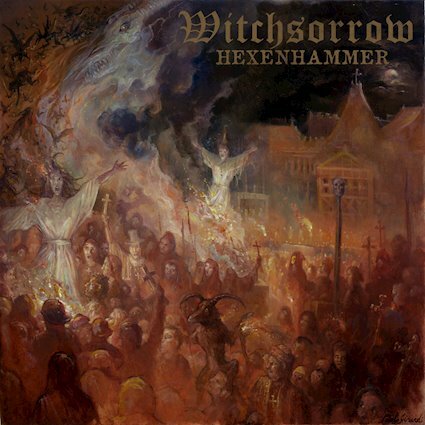 Witchsorrow have been on my radar for a few years now with their devastating brand of English doom. This trio has always crafted their own path in the world of heavy rock, but this latest record, Hexenhammer is far and away the most exciting release from the band to date. With a new melodic sensibility and a cruising forward motion that makes for a punch-you-in-the-gut majesty, Hexenhammer is the sort of record that doom freaks are going to keep on coming back too time and time again. There is something about the monolithic poetry of a song like Hexenhammer with its potent flanger effect and soaring guitars that reminds us exactly why we got into this. With this release Witchsorrow have achieved a new level of songwriting brilliance, fusing elements of everyone from Wretch and Electric Wizard to Witchfinder General, all under the watchful eye of Black Sabbath. This is the sort of record that you can easily get lost in and which consistently hints at weird new futures for the band. Many doom bands today really limit their sonic possibilities, some of the weird moments on this release suggest that Witchsorrow have a lot more to say. Despite any sense of exploration that you might get with Hexenhammer though this record definitely revels in its most straight ahead doom moment. The authoritative stomp of a song like The Devil's Throne speaks to a young band excited to be pushing out new material on a big label. This is the sort of over the top and potent music that people fall in love with. This is music born to revel in the underground. The frigid murk of this bands sound is going to fascinate and there is no end to the bleak sonic temple they have created.